This year, your raffle purchases have DOUBLE THE CHANCES! Prize Drawing on March 29, 2019 for TWO LUCKY WINNERS! Valid for TWO Domestic Round-Trip Airfares on Southwest!!!!! Two Round-Trip Tickets on Southwest & TWO WINNERS!!!! Prizes: Each winner will receive a prize package with 4 one-way Southwest e-pass awards* which can be combined for round-trip travel. *Things to know about the Southwest e-pass: Each individual e-pass is valid for one-way travel. Each Southwest e-pass is valued at $200. e-passes cannot be exchanged, extended or reissued. Travel must be completed by the expiration date. Spring Baby Season, in the Greater Houston Area, is just around the corner and we will soon have hundreds of hungry birds and mammals to feed in our Onsite Care Program! Our goal is to rehabilitate wildlife in need and help them to FLY (and run) FREE again in the wild! 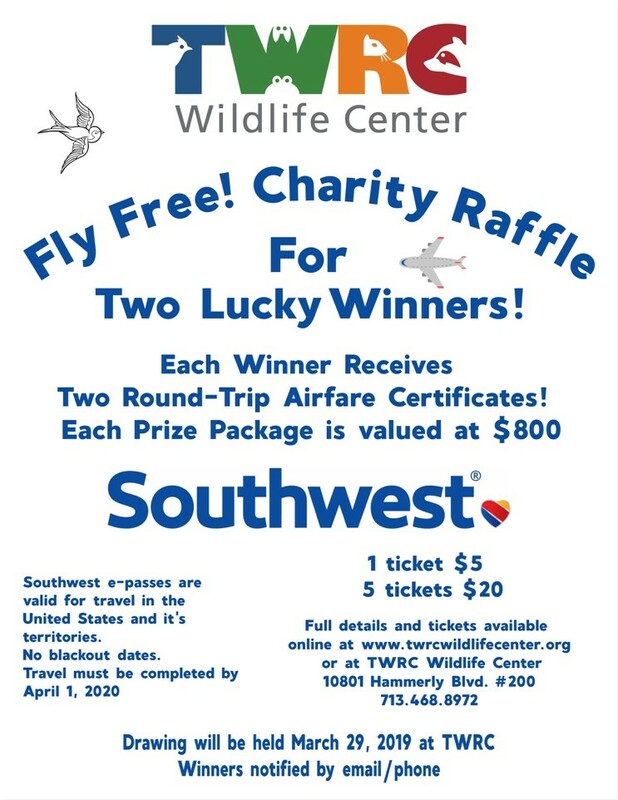 Your raffle ticket purchases directly support the work we do to save wildlife at TWRC Wildlife Center and you will be entered to win your own chance to FLY FREE!!! Online raffle ticket purchasing is no longer available.